Today’s ID cards do far more than just present a name and face. They can conduct financial transactions, enable you to log on to your PC and access networks, track time and attendance as well as grant building access. In addition, ID cards are an important extension of an organization’s image and brand. Consequently, those charged with designing and activating ID cards for their organizations have a pretty big responsibility. Every type and size of organization has different needs for their ID card program. Educational institutions, for example, can have a wide range of security requirements. At the most basic level, these institutions may simply be looking for a single, easy-to-use ID badge to provide the ability to quickly identify those who belong in school and those who don’t. Some institutions, however, may choose to have the cards control access to facilities, restricted areas and equipment throughout the campus and enhance operations such as library check-out and financial transactions. They also need the ability to easily replace lost or damaged badges. This is where a card personalization software package, such as Asure ID 2009 from HID Global, or Magicard ID from Magicard, can help. 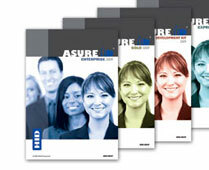 Asure ID 2009, HID Global’s revamped card personalization program, is a “complete rethinking” of the most effective ways to design and produce personalized IDs, says Lohman. It incorporates researched practices and user-tested tools, meaning the software now has a familiar face, he adds. The new software utilizes a Microsoft Ribbon look-and-feel that offers tab-driven navigation with fly-out control palettes. “The Ribbon organizes like commands in logical groups that are arranged onto tabs for specific functionality. This up-to-date arrangement puts each command no more than two clicks away, making creation of new card templates and data entry easier…because users can quickly find the commands needed to complete tasks,” says Lohman. To fit the varying needs of different organizations, like educational institutions, Asure ID 2009 comes in four editions with increasing functionality: Solo, Express, Enterprise and Exchange. The Solo edition provides entry-level card personalization and offers simplified processes for card design and a configurable data entry center that enables quick card production. The Express edition includes more advanced card design processes and a configurable data entry center, batch and sheet printing capabilities and external database connectivity that enables for real-time data exchange, says Lohman. The Enterprise edition goes further by enabling multiple workstations to share a common database. “Database connectivity is enhanced in this edition with the support of additional types of databases, as well as the linking of database fields with external data sources,” he says. For example, Live Link enables organizations to easily access data in external databases, such as those belonging to human resources, security or enterprise resource planning. The feature can set up data exchanges with a few mouse clicks. When it’s time to print, Live Link accesses and delivers the data that populates the external data fields on each card. The top-of-the-line Asure ID Exchange edition includes multiple workstation functionality with the support of additional database types and connectivity, and Live Link. Smart card support is accomplished with the iDIRECTOR encoding and management module. Lohman describes how one scenario might play out. A new employee, Mr. Brown, starts in HR where a person inputs personal data and takes his photo. An employee ID badge is then printed. His next stop would be security, where Brown’s personal data is loaded into the security system granting him physical access to secure areas. His fingerprint is scanned and encoded to the card and the HID format or card number is read from the card and matched with the new record in the access control system. Brown’s next stop is the IT department, where he’s issued passwords so he can gain access to the company’s network system. That information is also loaded onto Brown’s card. “Mr. Brown has now spent half a day stopping at each department to have his information added to each of the various systems, as well as loaded onto his card,” says Lohman. “The cost of the time to administer each step, plus the risk of error as data is input time after time makes this a cumbersome process and a drain on resources,” says Lohman. HID’s iDIRECTOR module makes this process easier, says Lohman. If the company utilizes Asure ID Exchange, Mr. Brown only needs to sit down in HR, have his photo taken and his fingerprint scanned. “A few minutes later, he has a card that allows him to access the building, his office and his computer,” says Lohman. UK-based Magicard has another card personalization package available. “Our customers told us that they wanted a simple software package that they could use together with our ID card printers for straightforward badging applications,” says Andy Matko, Magicard leader. Magicard ID is an entry-level program designed for users that want ease of use, and are working in a single location. “It’s very straightforward to use, with both standard card design templates, as well as the ability to develop custom card designs,” Matko adds. Regardless of the card personalization software package you use, Matko believes you should get it from the same company which produces your printers. Magicard ID comes in 10 languages, including English, Spanish, French and German.